Eco Friendly? There is a healthy debate that often rears its head when discussions turn to the eco friendliness of yoga mats with people often sitting in one of two camps. On one side there is the argument that using all natural materials is far better and more sustainable for the environment than products like PVC however the counter argument is that these mats may only last a couple of years as they are designed to biodegrade. The other argument is that making a good quality mat designed to last a lifetime from materials such as PVC uses less energy and is the more sustainable solution. The jury is out…! Nasty Chemicals? There are a lot of cheap mats on the market which have been manufactured in a way which causes a great deal of damage to the environment and to your health when practicing on these mats. During yoga we breathe deeply and as we begin to warm up and sweat, our pores open as well. If your mat is leaching chemicals and toxins, your body will be in the prime position to absorb them. When deciding on which mat to purchase, check out the safety standards that the mats meet. In Europe the highest safety standard is OEKO-1 which means the material is safe for contact with a baby’s skin. Closed Cell or Open Cell? Generally yoga mats fall into one of these two categories. An open cell structure will absorb water/sweat etc into the mat like a sponge whilst closed cell mats repel water/sweat not allowing it to seep into the core of the mat. Whilst the open cell mats may prevent a pool of sweat from collecting on the surface of the mat, these mats do tend to attract the growth of bacteria due to the nature of their design. They therefore need to be washed super regularly and open cell mats are notorious for the length of time they take to dry after a wash. Closed cell mats are much less prone to bacteria growth and are very easy to clean. Their closed cell structure means you can wipe the surface and they will dry very quickly as they do not absorb water into the core. Thickness? Choosing the thickness of your mat can depend on a number of factors. One of the big ones is do you travel a lot with your mat? If you are going to yoga on the London Underground every day then the chances are you would be better off with a thinner, lighter mat. If however you are lucky enough to have your studio just around the corner or drive to your studio then as a general rule, the thicker the better. Extra thickness provides more cushioning for the joints especially when practicing on wooden floors however a thicker mat can prove more unstable in balance postures (You can see this as a good thing or a bad thing!) Be warned, there are many cheap mats out there which tout an impressive 6-7mm thickness however the density of these mats are often very low meaning they offer little or no extra cushioning to a good quality travel mat. A good tip is to check the weight of the mat to try to judge density. 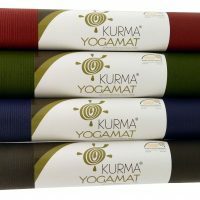 At Yoga Emporium our Kurma Yoga mats meet the highest achievable OEKO-1 safety standards for yoga mats and are manufactured here in the EU. They are a closed cell structure meaning they are very easy to clean and are designed to prevent bacteria breeding in the mat. They are made from PVC, designed to last a lifetime and are manufactured in a zero waste factory using a process which ensures no toxic emissions are released into the atmosphere. We sell both regular and extra large yoga mats which are all 6.5mm thick and made of super high density material. We also sell a thinner version which is 4mm thick and is great for those yogis on the move! Check out http://www.yogaemporium.co.uk/product-category/yoga-mats/ for more details.